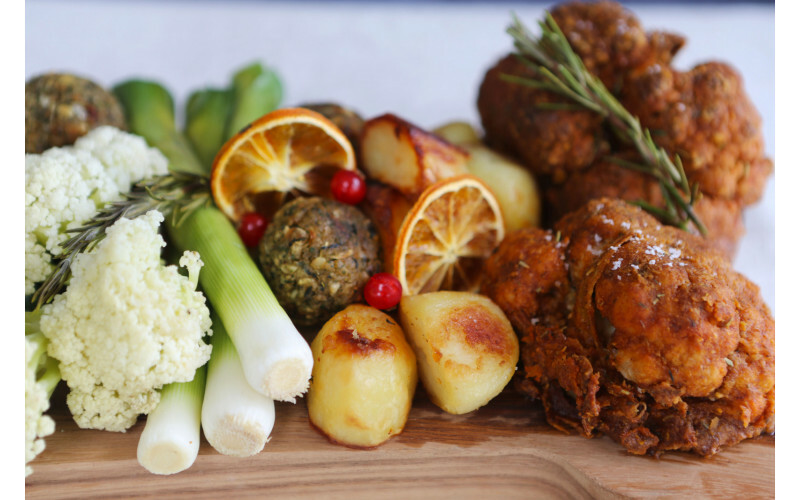 This recipe has been taken straight from our new Christmas guide: Over 25 recipes including starters, mains, desserts, cheese, truffels and cocktails... only £2! Cut each cauliflower in half and carefully (you need the cauliflower to hold together) remove any leaves and big stalks. Mix the plant milk with the stock in a large saucepan or bowl then soak the cauliflowers steaks for a minimum of 4 hours but ideally overnight. Preheat the oven to 180˚C (fan)/350˚F/Gas Mark 4. Thoroughly mix all of the ingredients for the coating in a large mixing bowl. Grease a large baking tray and heat in the oven for a couple of minutes. Dip each piece of cauliflower into the coating mix and make sure they are really well covered before placing them on the pre-heated baking tray. Bake in the oven for 60 minutes, turning frequently to make sure all sides are evenly cooked. If the coating is not browning, spray with a little oil. Sprinkle with toasted pine nuts and serve as a main or a side dish.